John Masters Organics` lightweight, silicone-free Conditioner for Normal Hair with Citrus & Neroli provides the right amount of hydration to hair without weighing it down. "An all round star! We loved it’s creamy lather, without too many bubbles, and gorgeous scent that was perfectly balanced. A gentle herbal organic shampoo which is pH balanced, has no sodium lauryl sulphate and good for all hair types including colour treated hair. Will leave you feeling glamorously green!" Aloe Barbadensis (Aloe Vera) Leaf Juice*, Aqua (Water), Cetearyl Alcohol, Simmondsia Chinensis (Jojoba) Seed Oil*, Behentrimonium Methosulfate, Stearalkonium Chloride, Guar Hydroxypropyltrimonium Chloride, Sodium Benzoate, Cocos Nucifera (Coconut) Oil*, Coconut Alkanes, Coco- Caprylate/Caprate, Sorbitol, Helianthus Annuus (Sunflower) Seed Oil*, Citric Acid, Potassium Sorbate, Citrus Paradisi (White Grapefruit) Peel Oil, Hydrolyzed Rice Protein, Borago Officinalis (Borage) Seed Oil, Panthenol (Vitamin B5), Tocopherol (Vitamin E), Hippophae Rhamnoides Fruit Oil*, Linum Usitatissimum (Linseed) Seed Oil, Arnica Montana (Arnica Flower) Extract*, Wheat Amino Acids, Equisetum Arvense (Horsetail) Extract*, Citrus Aurantium Dulcis (Neroli) Flower Oil, Cymbopogon Schoenanthus (Lemongrass) Oil*, Citrus Limon (Lemon Argentina) Peel Oil, Glycerin, Camellia Sinensis (White Tea) Leaf Extract, Canarium Luzonicum Gum Nonvolatiles, Chamomilla Recutita (Chamomile) Flower Extract* , Limonene^, Citral^, Linalool^. ^A natural component of essential oils. Apply to wet, clean hair. Leave in for 1-3 minutes. Rinse well (or leave in). Follow with styling product if desired. Hair will wilt if it`s still warm when you finish styling. A shot of cool air helps to set the style. The best hairdryers have a `cool` button for that final `whoosh`. Below are reviews of Citrus & Neroli Conditioner - 236ml by bodykind customers. If you have tried this product we'd love to hear what you think so please leave a review. Excellent leave in conditioner. No stickiness. 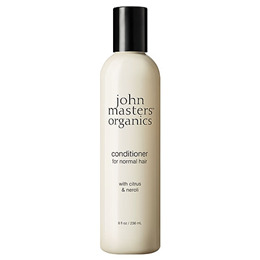 Works even on long hair with dry ends.